At the turn of the 20th century, just about every acre south and west of downtown Los Angeles was covered with barley...at least, this is the impression one gets when reading of the amazing development of the city at the time. Newspaper real estate transaction notices up to the Great Depression reveal a seemingly endless succession of new subdivisions replacing the barley, developments of every type of house, from the most basic cottage to the iconic California bungalow to the more ambitious upper-middle-class dwelling to the very largest sort built by the city's preeminent downtown oilmen, lawyers, insurance executives, and, of course, real estate investors. 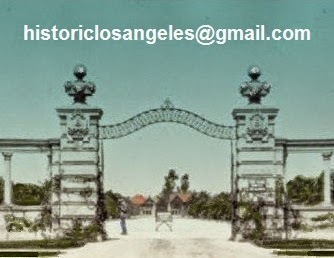 Of the latter was William R. Burke, who came to Los Angeles from his native Arkansas sometime before 1885. His extremely successful dealings in land culminated in his 1903 purchase of a barley field on high ground south of Washington between Western Avenue and Gramercy Place (then known as Hermosa Street in these precincts)—approximately 20 acres. 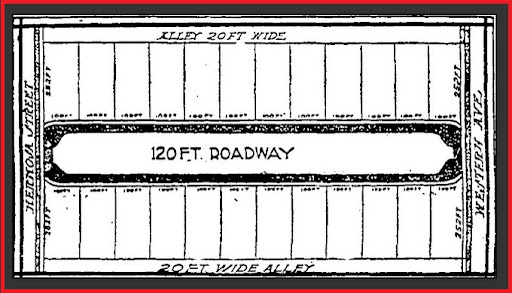 Burke's original plan called for 24 lots, 12 to a side of a 120-foot-wide drive more or less in line with 22nd Street to the east. Improvements to Burke's new development began in December 1903, and, using the best materials and craftsmanship, lasted until April 1905, with the public invited to view the results from that month. The street was to be private and gated—very much along the lines of many suburban American developments of the time that followed St. Louis's pattern of Benton, Vandeventer, Westmoreland, and Portland places. Burke gave his exclusive new street the name Berkeley Square—not after or pronounced as the London square of the same spelling, but rather for the northern California town. (You don't suppose he might first have contemplated the name Burkeley Square, do you?) What came into existence was what must have been in its heyday a lovely picture of Southern California—serious houses by serious architects amid towering palms. And then it was over—the lure of Windsor Square, Hancock Park, Beverly Hills, Bel-Air, Brentwood, and Pasadena, to name a few, became too great after the landmark 1948 U.S. Supreme Court decision that ruled unconstitutional the restrictive covenants precluding residency of African-Americans and other ethnicities in certain neighborhoods...the houses were aging and expensive to maintain...and the wall-like Santa Monica Freeway was eventually aimed almost directly through the Square. The social ramifications, however, are not my primary aim here. I'd like merely to describe, post by post, what is known about each house and its occupants, to rescue the Square, as much as possible, from obscurity. NOTE: As with any such endeavor, I've found there to be numerous instances of conflicting information, spellings, and errors in original newspaper reportage as well as in photo notations by various archival institutions. I welcome any corrections or additions here—indeed, it is my hope that readers of this blog, perhaps even descendants and friends of the denizens of Berkeley Square, might possibly turn up with new or revisory information, and perhaps even actual memories. Oddly enough, several weeks ago on the opposite side of the country from our subject, I found myself at dinner with an old friend I knew to have some Southern California antecedents, but never to be the great-granddaughter of the builder of #1 Berkeley Square, as we discovered that night. A New Yorker by way of Chicago, the name of the street seemed to conjure up for her something lost needing (if not exactly desperately!) to be acknowledged, in this case a lost California dream—which exactly parallels my purpose here.